На данной странице приведено описание и видео "основных" трюков скейтбордистов. Сотрудниками кафедры "Теоретическая механика" совместно с фирмой AlpineReplay, Inc. проводится построение математических моделей данных трюков. Straight jump without rotation (except for the rotation required for jumping). Kick flip is a 360 degrees rotation of the board around the long side. 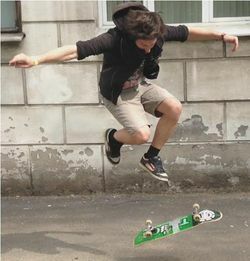 The same as the kickflip, but the rotation is in the opposite direction. Kickback is a 90 degrees rotation around the long side of the board and the kick flip in the opposite direction. Pop shove-it is a 180 degree rotation of the board around vertical. A 360 Pop Shuvit with a kickflip. A 180 Pop Shuvit with a kickflip. Hardflip is a 180 degree rotation around direction orthogonal to motion and 180 degrees rotation around the long side of the board. The board completes one rotation by rolling around the skater’s back foot, in much the same manner as spinning a baton with one’s hand. It is considered good style to make the board flip as vertical as possible. If the board spins laterally or comes off the back foot, it tends to end up looking more like a 360 pop shove-it. This trick can also be done with the front foot. That is called a “front foot impossible”. Последнее изменение этой страницы: 00:02, 9 ноября 2013.